Although not a true Sovereign flag, only a State flag with a Common Law seal can directly represent the Common Law. There is an indirect relationship to Individual and state sovereignty with the U.S. Civil Flag.. A solvent federal government flying a Civil flag, implies solvent States/Nations with Sovereign citizens. 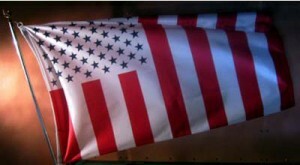 When we first came across the Civil flag and decided that this flag should be the symbol for all sovereign citizens we looked back to the Sons of Liberty and their “Rebellious Stripes” flag as our example. We wanted a flag that would address the deep need in Americans to awaken and return to a time when our government was not “Big Brother” hidden under the name of the Patriot Act! Just as some surmise how the Sons of Liberty turned the British East India Company’s flag on its side; we also decided to turn Old Glory on its side. We wanted the flag to represent our modern Union of States, we chose to create a flag that had 13 vertical stripes and 50 blue stars on a white background: One star for each Sovereign State of the Union of the united States of America! Note: the Flag that we daily see is a military flag, and which is why much of the issues in our country still exist especially from the alleged corporate world that have us the people enslaved as if we are at war with them! This mammoth fabricated lie have got to END, as we are declaring peace with the now dissolved corporation which headquarters are in Washington DC. Meanwhile know the differences in the Civil Flag and the Military Flag, and start being what you are: a sovereign America citizen under one sky, one people, one Flag, and one love.